Today the duo ventured to the Hills and Holes in Barnack. A National Nature Reserve where all year round the landscape is managed to allow the wildflowers to grow uninterrupted. Have you been there? The Pasque flower could be described as a National treasure. It really is a delight to see their heavy bobbing heads in the wind. This was our mission and it seemed that it was also the destination for many other admirers of this wildflower gem. Growing so close to the ground they present a tricky challenge to draw. After negotiating around the flowers and the ups and downs of the landscape, it's necessary to get down low and personal with the wild things. A worm's eye view really does give the best perspective! As a result of the prolonged cold patch there's so much happening this Spring, the Hills and Holes were awash with wildflowers alongside the pasque flowers were: bluebells, cowslips and early pink orchids each dotting the landscape with their hue. We met so many folk today walking amongst the dunes some having travelled from Nottingham, Leicester and Grantham to catch the pasque flowers in their prime. Is The Hills and Holes a favourite spring day destination for you? 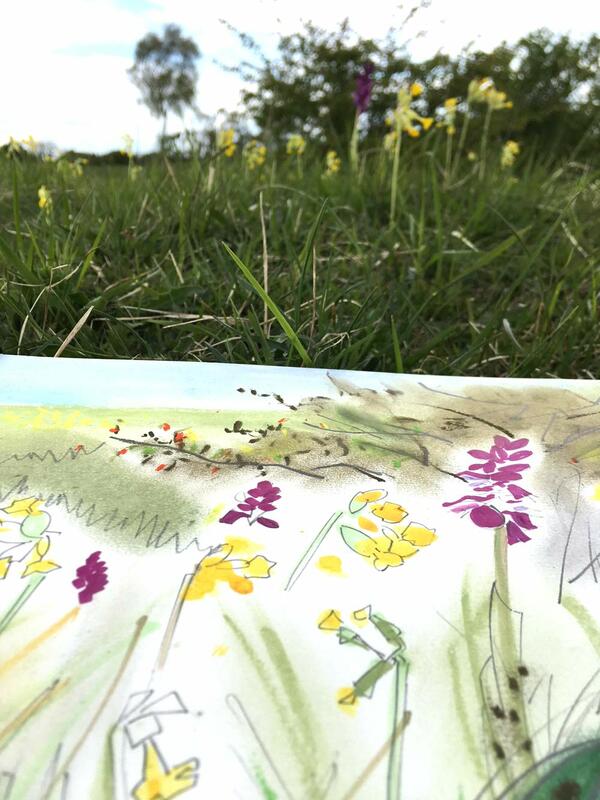 WildlifeBCN and Kombisketchtour invite you to Sketch the Nature of Summer on Sat 23rd June 10am - 4pm at Old Sulehay Nature Reserve, Yarwell, Northants. Read on to take peek at the wonders waiting to delight you at Sulehay. See link below for workshop details. Learn what Kombisketchtour get up to in LandScape magazine…out now! What a great start to the sketching season. Kombisketchtour's Nature Sketch at Sulehay Nature reserve connecting with the elements. Growing so close to the ground the pasque flower presents a tricky challenge to draw. A worm's eye view really does give the best perspective! From a distance a blue mist hovers over the green ground foliage. Gradually each tall bowing stem of blue flowers comes into focus. There are many things to look forward to over the coming months as we head towards brighter days. We'll be heading to Sulehay Nature Reserve to deliver 'Nature Sketch' for The WildLifeTrust BCN. Read on for more details.